A modular green roof tray, featuring a self-contained, easy fit and forget system to supply a natural sedum or grassed surface without the hassle of layer build up, separate membrane layers and drainage layers. An in-build reservoir and unique tray make-up ensures a quality green roof without the hassle of worrying about irrigation as it is all encompassed within the tray. The tray comes to site pre-grown in palletised form ready to go, lay the trays (4 per square metre), clip them together if required, fit our edge system if required and go home, Simple! A single or double layer of grids to any depth, grown off-site and supplied in pallet form. Surfacing may be required to be 100mm deep. Here a layer of s50 is laid down first and filled with a lightweight growing medium; then the pre-grown s50 tiles are laid on the top; thereby giving a 50mm surface layer and 50mm root zone layer. Any roof surface from flat to heavily inclined from 50mm to 200mm onwards. Any depth, any slope anywhere. Once the roof is clean and free of debris, the trays or grids are laid. If in doubt; you may wish to consider a protective non-woven membrane to ensure there is no damage to roof surfaces if they are old and in a poor state. Always ask for advice here. We offer an anchor pin system to affix individual trays together and an edge and pin system to create a clean edged finish for your green roof. Green roof tray anchor system. Green roof Aluflex edge retaining system. Green roof variety of sedum or grass mixes. Green roof Ecogrid angular piece to allow laying of grids over a roof apex. Unique, robust, click and fix system. Simple fit and forget solution. 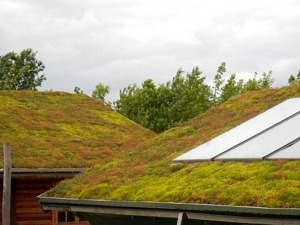 Our EcoGrid Ecosedum green roof solutions are designed for people to fit without any skill set at all. EcoGrid Ecosedum green roof trays can be sold pre-planted with your own mix of plugs or as a tray-only option.